New York, NY – Globally recognized as an engineering marvel and symbol of New York City, the Empire State Building (ESB) has selected Philips, the world’s leader in lighting, as its partner to transition the building’s iconic tower lights to innovative LEDs. The two organizations have pushed the boundaries of LED technology to develop a state-of-the-art dynamic lighting system from Philips Color Kinetics that is unique to ESB and will allow the building’s façade and mast to change lighting scenes in real-time. In addition to greater control and management of the lighting, the new system will deliver the superior light levels for the design, as well as allow ESB to highlight its architectural details. 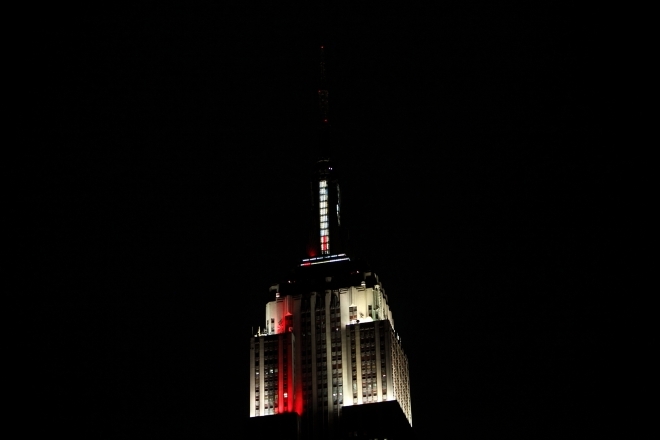 ESB celebrates many cultures and causes in the world community with iconic lightings. Its tower lights recognize key milestones, events, charitable organizations, countries and holidays, a tradition started in 1932, when a simple searchlight was used to announce the election of New York-born Franklin Delano Roosevelt as President. To honor the United States Bicentennial, ESB installed colored floodlights to illuminate the building at night, lighting up red, white and blue, leading to today’s very popular Lighting Partner program. The new Philips LED lighting system will help to enhance this program by making each lighting more unique and special. ESB is replacing its traditional light fixtures with LEDs as part of its 21st century renovation. The new computerized system will allow customized light capabilities from a palette of over 16 million colors, including hard-to-achieve pastels, in virtually limitless combinations. The LED lights will replace the current palette of 10 colors, which also requires a team several hours to change the building’s nearly 400 fixtures. 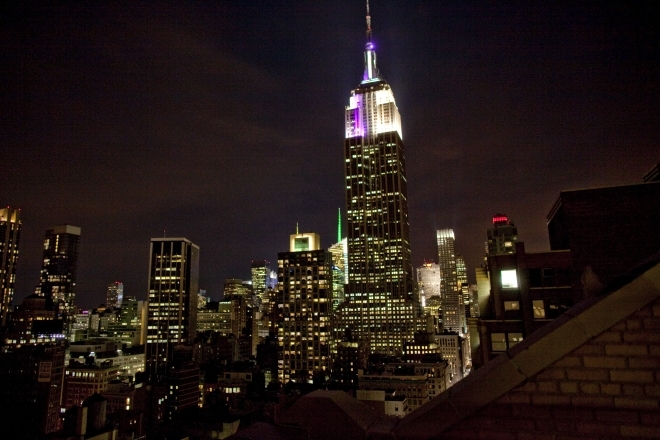 Soon ESB staff will be able to create and update customized lights, using new energy-efficient technology. Moreover, using Philips Color Kinetics LED lighting technology will make it possible to control and focus the light exactly where and how the effect is desired. Ripple, cross-fade, particle and burst effects, previously not possible, can be easily automated to create unique lighting designs. The new Philips lighting system will also allow the building to minimize light spill, ensuring that light is focused on the façade and mast, while providing enough light to allow the building to be seen from anywhere in New York City. This feature not only respects the night sky, but the building’s neighbors as well. 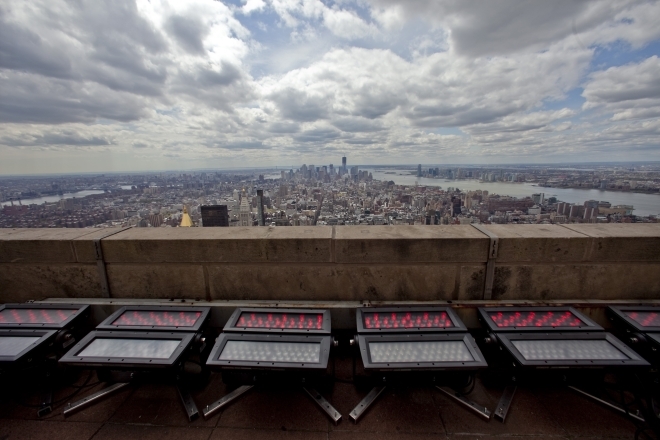 “Lighting the Empire State Building has been a technical challenge and aspiration for us, and one that we have been working on with the ESB for years,” said Jeff Cassis, general manager of Philips Color Kinetics. “We have been developing our LED technology to create a solution that could achieve the right light levels and design for the building’s façade, while keeping true to the building’s identity as an iconic symbol of New York and building innovation. The result is a unique LED lighting system that creates as much light as the traditional light sources that it is designed to replace, yet one that can be adapted on the fly to redefine the New York City skyline.